Inter Milan and Tottenham not only did battle at the San Siro in the Champions League on Tuesday evening, but the pair also clashed in the UEFA Youth League, which saw two young Irish starlets go head to head. The Italian side were captained by Clare-born youngster Ryan Nolan, with Tottenham starting 16-year old prospect Troy Parrott up front, and both players were heavily involved in the action. After Facundo Colidio gave Inter the lead, Spurs managed to get back into the game after Nolan fouled his fellow Irish man Parrott conceding a penalty which Cyprus underage international Jack Roles dispatched. Parrott’s involvement in the game did not end there, however, as he received a second yellow card for a challenge on the Inter keeper, but was bizarrely not sent off, with the referee forgetting initially that the young striker had already been booked. Tottenham then substituted Parrott for Rodel Richards before the Inter players screamed at the referee to remind the official of his earlier booking. Parrott was given his second yellow card while on the bench, with substitute Richards exiting the field of play. Inter were then also reduced to ten-men later on in the game with Tottenham’s U19s managing to perform better than their senior counterparts picking up a 1-1 draw. 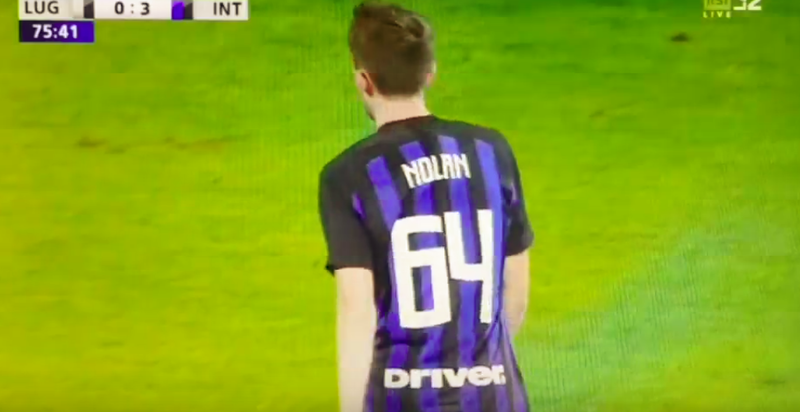 19-year-old Nolan recently signed a contract with Inter Milan after making his first-team debut in pre-season and has been an impressive part of the Nerazzurri’s U19s side. Similarly to Nolan, Parrott also signed his first contract at his club during the summer after an incredibly impressive European campaign with Colin O’Brien’s Irish U17s side. Let’s hope we get to see the pair squaring off in the Champions League sometime in the near future.